Give your young child the proper religious upbringing they deserve by familiarizing them with the blessings of a rosary from an early age. 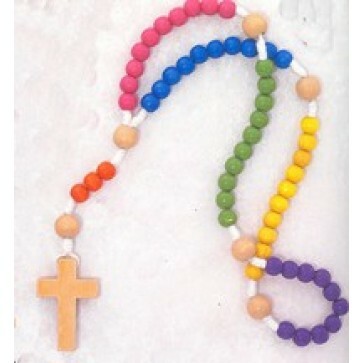 The non-toxic Kiddee Rosary is not only fun and colorful, but also a great learning tool for kids of all ages. Babies will be drawn to the vibrant colors while older kids will enjoy practicing their prayers as you guide them and help them grow into young adults. The dye stays firmly in place on the Kiddee Rosary which was designed for babies.